Ion Audio's original iPad iCade started life as a ThinkGeek April Fool's joke but has since become one of the most well supported iOS game controller accessories. If you aren't familiar with it, it was a small arcade cabinet stand that allowed you to prop your iPad up and play games using a real joystick and buttons. The company behind the iPad gaming accessory has now announced that they have expanded to three new models to service a broader range of iOS devices. iCade Core - Pictured on the top right, the iCade Core offers a stripped down version of the original iCade cabinet and supports the iPad, iPhone and iPod Touch. Like the original iCade, the iCade Core lets you play your iOS games with a real joystick and buttons. Communication is done through Bluetooth, but a 30-pin connector is included to allow for charging while playing. No pricing yet for this slimmed down version. iCade Mobile - Pictured top left, the iCade Mobile is a device that wraps around the iPhone or iPod Touch to give you more of a mobile handheld gaming experience. Again, using Bluetooth alone for the communication, it offers a swiveling landscape or portrait orientation. This one will cost $79.99 when it becomes available this spring. Engadget took this video showing it in motion. 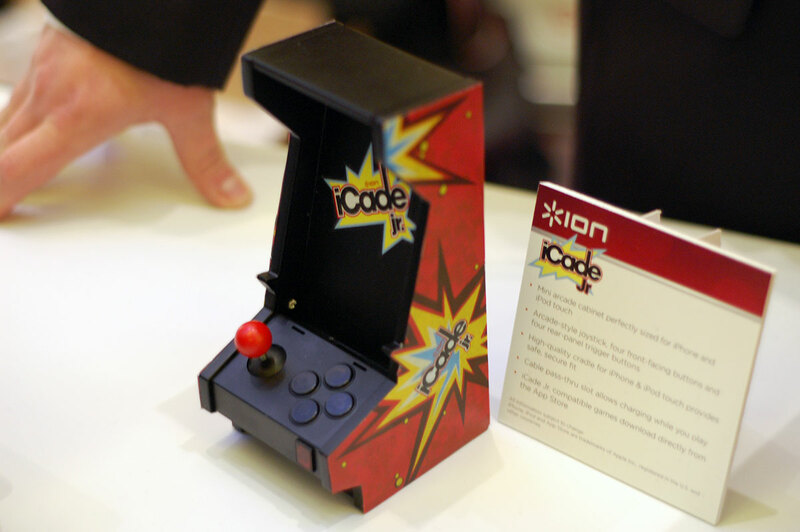 iCade Jr. - Pictured below, the iCade Jr. is a shrunk down version of the original iCade. This version is made specifically for the iPhone or iPod Touch and lets you prop up your device in this miniaturized arcade cabinet. It comes with an arcade joystick and 4 front facing buttons a 4 rear facing buttons. It also offers a dock connector for charging. This one is expected to cost $49, again coming in spring. There have been other similar mobile gaming accessories for iOS devices, but the iCade seems to be the one that has garnered the most support amongst gaming developers. The new devices will likely be directly compatible with the existing list of iCade compatible games. The most notable titles include Atari's Greatest Hits, Pac Man for iPad, Temple Run and iMAME (no longer available). I'd hate for there to be a lot of competing iOS controllers. Four years ago I mocked this up. Nice to see something coming to market. Nice. I like the iCade more than I expected I would. And more iCade models = more iCade support in games! The little one looks tippy unless youre a very gentle gamer! But at $49, Id choose it as my charging dock, and just think of the stick/buttons/cabinet as just a fun added novelty factor. 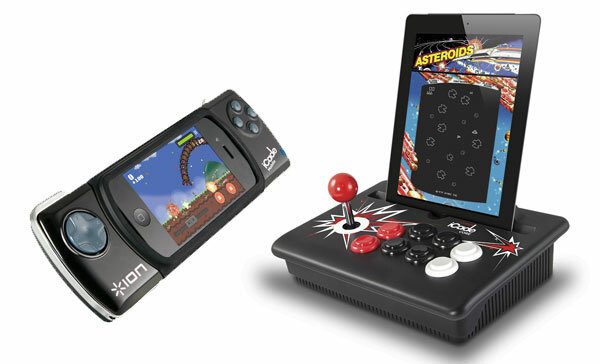 iCade seems to be the most mainstream one. *Apple ~4 years ago* "physical buttons are dead. Touch is the way of the future!" *App-makers today* "we can't be bothered making an enjoyable and intuitive touch interface, let's just go back to physical buttons"
Touch certainly works well in many games. But not all. The two biggest problems IMO are that virtual d-pads just aren't nearly as responsive as their physical counterparts and the lack of shoulder buttons means that you have to juggle your thumbs around more complicated controls (such as those for an FPS). Why are they still on Bluetooth? If Atari can get a dock connector working these guys should be able to. Maybe they'll get there once Apple finishes their work on making it easier for 3rd parties to use the dock connector. Because not all games play vertical. Some times you need to place the ipad in landscape view. Do these work with any games or do the games have to be compatible? I could see that mobile one really being nice for stuff like GTA, Tomb Raider, many Gameloft games (like Prince of Persia), and other ones where having buttons would improve gameplay (while I think those games are playable and fun without the buttons and it's not worth buying a separate gaming system for I do think that buttons on some games definitely can't be beat by a touch screen). - The iCade devices (and those compatible with them) work by emulating a bluetooth keyboard, and the app developers have to offer keyboard controls support (even though they wouldn't offer a keyboard on the screen). The limitation of this is that it's not really easy to program analog controls this way, so the iCade is not likely to be compatible with any game that really needs analog controls. Also unless the device has a dock connector just for providing power to the iDevice, the accessory and the iDevice have to be powered separately. - I think it's possible in principal to license the Dock connector and then have the device wired to the iOS device, but I don't think any controller like this is on the market. If this came out, I think it would address all the issues above at the same time (aside from being wired and not wireless, by definition). In all the scenarios, though, the device has to be supported by the app. Since every app has its own touchscreen controls, there's probably essentially zero likelihood that there'll be a device that would offer support for games that weren't designed for it (I'd be glad to be wrong, but it would be a Herculean task to design that). Now if they make one of these cabinets with a KNOB instead of just buttons, I'll really get my Tempest on!! No. Not all games are time wasters. Some are. For instance fast games. Some are not. For instance. Games with a plot and stories. Funny, I thought it was the reverse. Games with stories are just advanced time wasters. Better at it. The Mobile will be mine. Oh, yes. Am I the only one who thought it looked like an Atari Lynx? First thought for me as well.